At Colton Teak, we pride ourselves on unparalleled customer satisfaction. In addition to our very progressive lifetime warranty, our friendly and knowledgeable sales staff, and our unwavering commitment to quality, we also provide you with a risk-free shopping experience by offering a full 60 Day Money Back Guarantee. 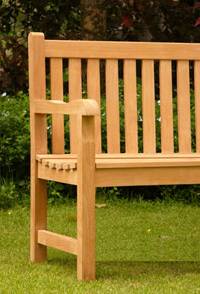 We have every confidence that once you see and touch our exquisite teak furniture, you will love it. However, in the unlikely event you desire to exchange or return any portion of your order for any reason, please contact us directly at 734.418.0150 or utilize our Contact Form to arrange the return or exchange. Goods must be returned in original condition and original packing, including boxes, pallets (if applicable) and packing materials to qualify for this guarantee. Upon receiving the items and verifying original condition, we will issue you a prompt refund of your full purchase price (less the cost of shipping) with no restocking fee. For details regarding our progressive warranty, please see our Lifetime Warranty policy. Each and every item is packed to ship once ordered by our expert warehouse personnel at Colton Teak. We have worked closely with Fed Ex to institute all recommended measures to insure no damage occurs in route to you. However, damage can still occur. It is critical to open all packages upon receipt to inspect for broken parts, etc, even if you do not plan to assemble or use at this time. It is very important that any shipping damage be reported to Colton Teak, in writing via our Contact Form or email to support@coltonteak.com, with SEVEN (7) DAYS of delivery of any package by Fed Ex Ground or Freight. Fed Ex will not honor any damage claims made after seven calendar days post delivery of the item in question. As such, Colton Teak cannot be responsible for shipping damage incurred but discovered or reported past this industry standard shipping seven day period.